Today I’m covering a few new launches from Charlotte Tilbury including her Genius Magic Powder ($45), Magic Away Concealer ($32) and swatches of the new Stars In Your Eyes Palette ($75). I’ve been the biggest fan of her Airbrush Flawless Finish Pressed Powder in #2 for years now. It’s one I still swear by today and I was really excited to put her new face products to the test. I hauled everything from Nordstrom and two of the three products I hauled are hits. Up first is a look at her new face products. The Magic Powder is a loose powder for under the eyes and all over the face. It’s a soft light-diffusing powder to blur the skin. I find that the Airbrush Flawless Pressed and Magic Powder Loose colors don’t match with the same numbers. #2 in the pressed is a perfect match for me while #2 in the loose is significantly lighter in color but it does have a translucent feel to me. The powder itself has a really nice matte effect without looking flat or cakey even though the color is pale. The jar seems well made and has a twist lid inside so you can keep powder from flying around when you store it. The only downside is the smell – it has a very strong plastic smell which I thought was the packaging, which could be the culprit. But if it is, it is also in the powder and it’s pretty bad. The good news is that once it’s on the face and sets, the smell dissipates after a while. Still it’s a scent I don’t think any makeup product should have. A quick look at the product description says it’s made of veggie powder and natural oils to absorb oil and condition the skin at the same time. This could be the reason it smells. For now I’m going to stick with the pressed version and other brands of loose powders. My favorites rounded up and reviewed here. Left is applied heavily straight from the tube, you can apply as much or as little as you want. I did a heavy face swatch so you could see the color and texture. Right side is completely blended out with a sponge. Also wearing a mix of Charlotte Tilbury Magic Foundation in 6+7 mixed all over the face, Diorshow Brow Styler in Universal Brown and NARS Velvet Lip Glide in Swing on the lips. Top from Madewell. I’ve swatched the concealer below next to the NARS Radiant Creamy Concealer in Custard, Macadamia and Ginger. I’ve also included one of the new MAC Studio Fix 24 Hour Wear Concealers in NC35, NC38 and NC40 (reviewing these soon, but I find this formula runs a tad bit lighter than the foundations). The Stars in Your Eyes Palette is new for the season and it is one of the most beautiful warm palettes I’ve tried. I still don’t consider myself as really loving the red/warm eye shadow trend that’s been going on for a while, but this one is very wearable, doesn’t look too warm on my skin and has excellent color payoff. There is a mix of matte and shimmers. I think it’s a significant improvement compared to last years which I bought and still use but find high maintenance because it takes me a lot of layering to get the pigment I want. This year’s is perfect in every way for me. This one has four sets of color-themed trios designed to Prime, Enhance and Smoke, but you can mix and match any of the combinations. As much as I love the pretty rose gold packaging it makes photographing product difficult. Colors will look slightly different in photos depending on what you see in the reflection, so I’ve included two photos, one with flash, one without. Overall I highly recommend the Magic Away Concealer. I think it’s worth a look if you want a full coverage, smooth creamy concealer. It doesn’t cake or crease on me under the eyes and it also has enough pigment that you can use it to cover spots like sun spots or dark circles. I find it has better coverage than her other formulas. The Stars in Your Eyes Palette was a pleasant hit given last year’s formula was just ok for me. I’m thrilled that even though it’s warm toned it’s not too red or warm and easy to wear. The Magic Powder was something I had such high hopes for. The shades are a bit odd to me because the numbers don’t match in different formulas and the smell is so bad, but as a product it works on my face just fine. For now if you’re in the market for a new loose powder I’d say my top picks are the Hourglass Veil Translucent Setting Powder and Laura Mercier Translucent Loose (both compared here). You can find the Charlotte Tilbury Magic Away Concealer, Powder and Stars in Your Eyes Palette at Nordstrom. Also available online at Charlotte Tilbury. The new shadows are improved over the original but I really liked the original formula. Differences are in packaging design and texture. The revamped version is softer and velvety with a texture that seems to glide on the skin better. Pigment and color payoff is similar to me, I do think with the shimmers the softer velvety texture makes for a richer finish. All the colors layer and blend with each other beautifully. First a look at the new vs old packaging. I like the concept of removable pans to make my own palette. I think all brands should have this option with singles! I’m still trying to find a good palette solution for these – they do have one they launched a while ago but it hasn’t held up the best for me. The Single Eyeshadow comes in 42 shade options. There are a different finishes of matte, shimmer, satin. Some retailers split these into Soft Essentials for Mattes, Precious Metals for shimmers and Pops for bright colors. The ones I tested were all excellent in color payoff, texture and smoothness. 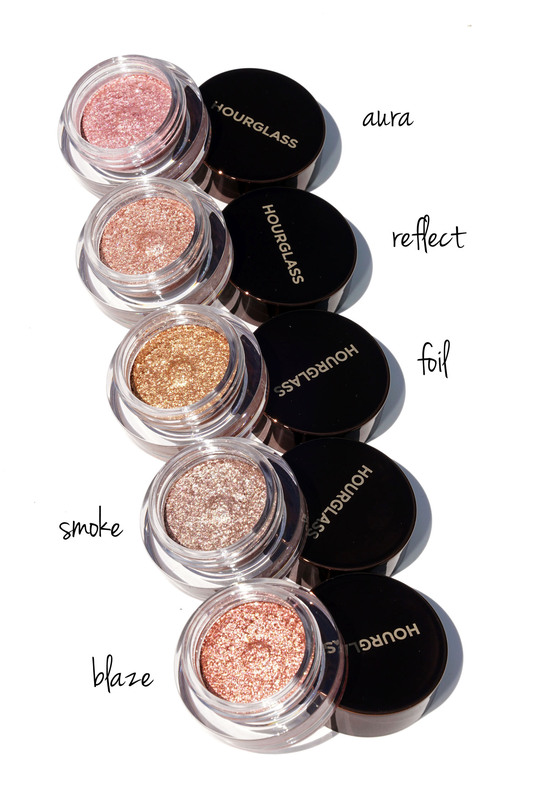 I’m partial to the shimmers for their buttery soft texture that glides onto the lids perfectly. Color I have include a mix of press samples and ones I purchased on my own. Swatches below, to me Ashes to Ashes and Lahore almost look identical on my skin. Lahore has more pigment and shimmer, but the colors look really close. If you have a pink undertone you will probably see the difference more. I’m tan olive. 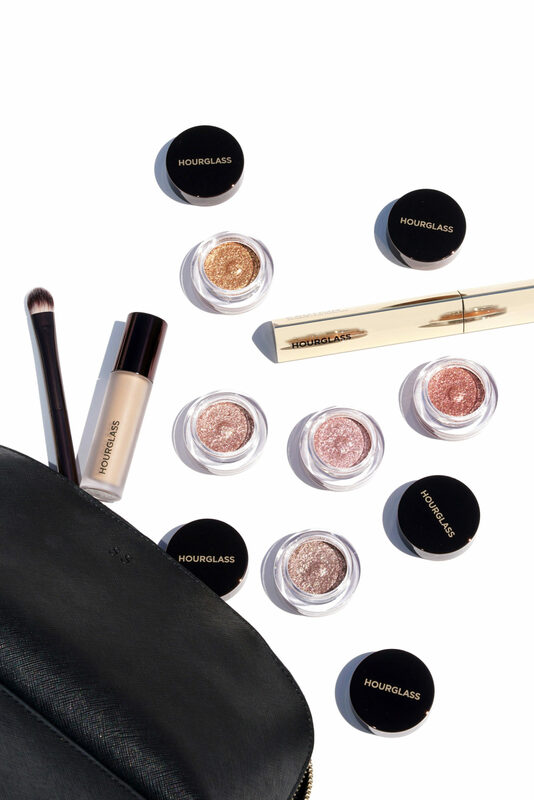 The Hardwired Eyeshadow Singles are ultra shimmery and metallic. I had my eye on a few so I stopped by the store to see them. The ones I wanted looked ultra glittery while the ones I had were more of a refined metallic. I may go check them out again as my experience with the four I have blew me away. They’re so pigmented and non-gritty like you’d expect. 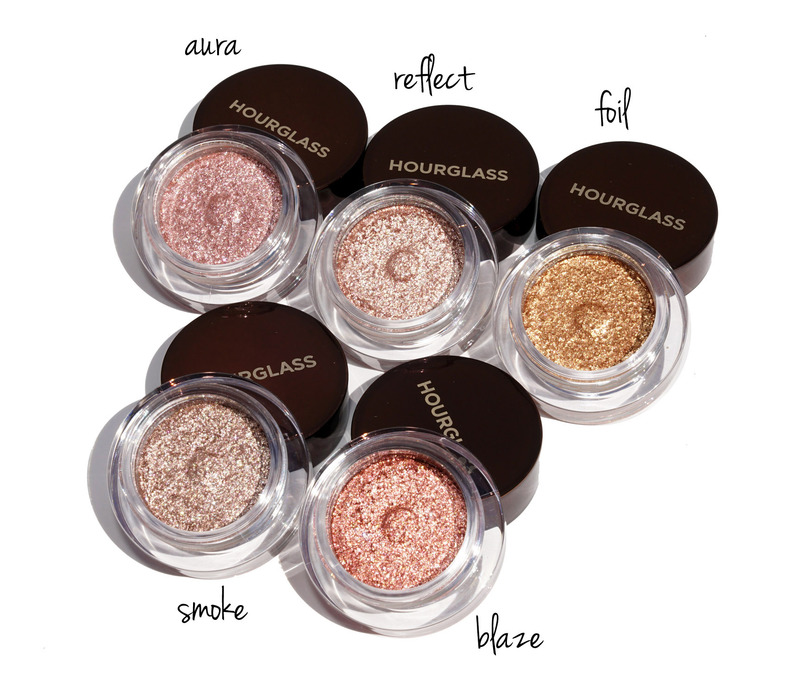 The shimmer is ultra fine and adheres to the skin really well. Photos can’t capture how beautiful these are. The Duo Eyeshadow has been relaunched in a lot of repromoted shades. Based on a comparison of old vs new, the colors with the same names are very similar but I see slight differences. Pigment wise the newer ones adhere better to the skin and have a softer smooth texture. Color payoff is similar though, my experience is that the color is really good and lasts a long time. 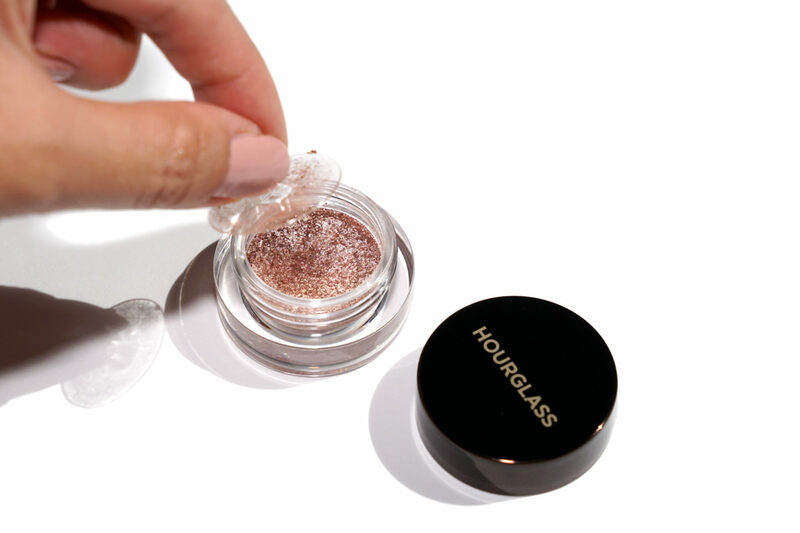 The Tinted Smudge Proof Eye Base now comes in tinted form. I ordered both Light and Medium as I wasn’t sure what color I’d be. Medium is my match and I’ve swatched it next to a few Radiant Creamy Concealers in Custard, Macadamia and Ginger for reference. I wasn’t a fan of the original clear base simply because it’s not meant for my skin type. I know many love matte bases for eyeshadows but I don’t have oily lids so most tend to dry out my skin. I prefer something creamy and emollient. These new Tinted Bases are ultra pigmented and a little goes a long way. They have a velvety matte dry down so while it will help the shadow stay put all day long I found them too dry for my skin type. It is an excellent product to even out the lids and help create a nice canvas for powder eye shadow and once it sets it is indeed smudge-proof. Last but not least a quick mention of the Climax Mascara*. I’m going to do a roundup soon of mascaras I’ve been trying and this one is excellent. 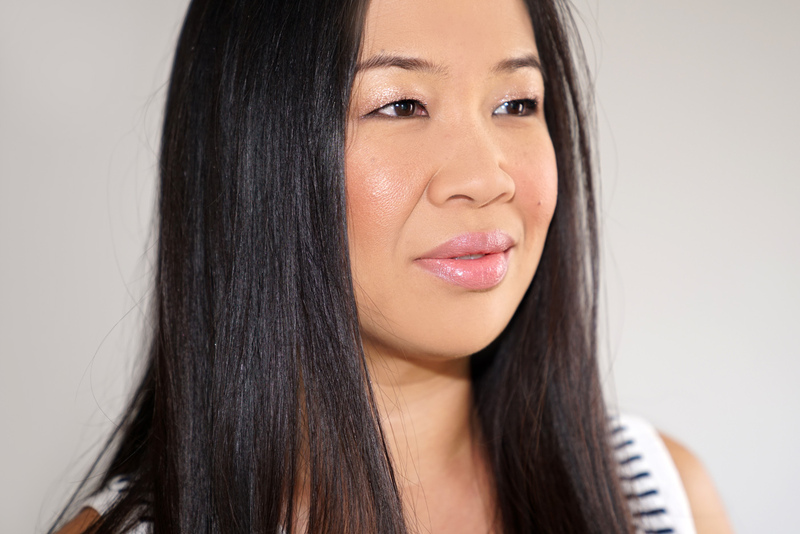 It volumizes, doesn’t clump, holds the curl and is almost smudge-proof. Indoors in air conditioning it does not smudge on me. But outdoors for extended periods of time here in Florida we are still having humid weather with temperatures in the high 90s sometimes exceeding 100. In those cases minor smudging occurs. But overall this is an excellent formula. A quick look at some of the originals I still have versus new version. I think the colors are really close but there are slight differences. The original Alhambra is a tiny bit peachier. Original Kalahari is cooler-toned. Original Ashes to Ashes is the slightest bit warmer in undertone. Overall thoughts are positive. I think there has been an improvement in the new formula although I never had issues with the original ones. I really like that the pans are removeable and hope they come out with a large empty palette like MAC does that I can use to put the shadows in for travel or to make my own palette. I’m going to give the Hardwired shades another look, especially Pattaya because the formula is really good. I personally don’t love the Eyeshadow Bases but they aren’t bad – they’re just not what I like to use because of the matte finish. 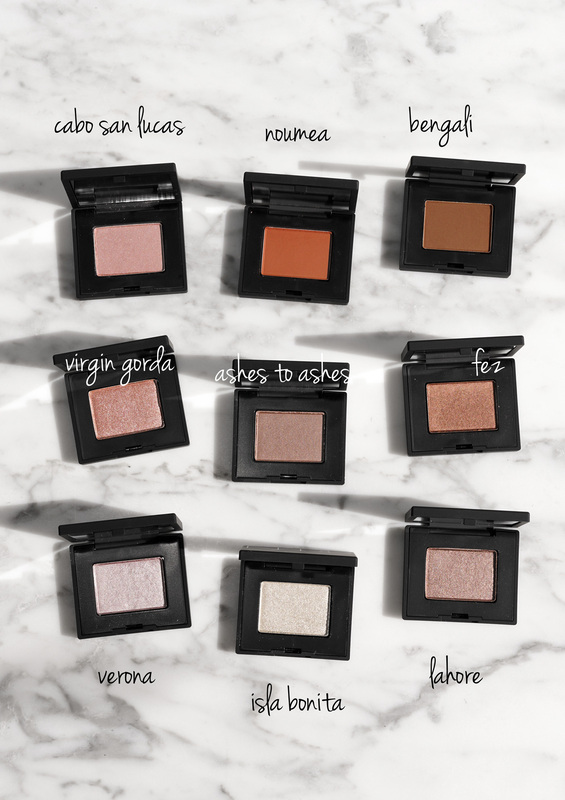 You can find the NARS Eyeshadow Singles and Duos out now. Some shades seem to have been selling out quickly so you may have to shop around to find the colors you want. Available at NARS Cosmetics, Nordstrom, Neiman Marcus, Sephora and all other NARS retailers. Some items featured are press samples, others purchased by me. Press sample shades have a * next to them.